Richmond now has a Dumpling Trail! If you follow me on Instagram, you would see in my IG Stories that yesterday I received a pretty neat surprise at lunch. Tourism Richmond delivered some freshly made dumplings from a number of Richmond restaurants. Why, you ask? There’s now a Dumpling Trail in Richmond! The Dumpling Trail is a self-guided tour of 15 restaurants in Richmond that serve up a wide variety of dumplings. It’s been awhile since I’ve enrolled in a course. Even though it’s just a 3-day course, and it’s a course meant for working professionals. Still, the concept of carrying a backpack and dressing casually had been a distant memory. So when work sent me to a 3-day class downtown, I had to scout out my lunch spots. 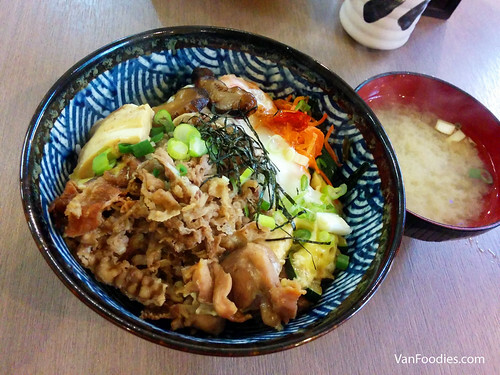 And then there was Kita no Donburi right across from the campus (I was at the Morris J Wosk Centre for Dialogue). Let me first start by saying, it’s weird to eat alone. I don’t like sitting by myself and all I have is my phone, emails and social media. Occasionally I like to chat with my dining companion too, you know. Not having made any friends in class just yet, I had to eat alone at Kita no Donburi. On the first day, I ordered the Chanko Don. It caught my eyes right away on the menu because it just had everything – beef, chicken, prawn, tofu, enoki mushroom, shitake mushroom – all ingredients I love! And it came with a miso soup. It was a satisfying rice bowl. 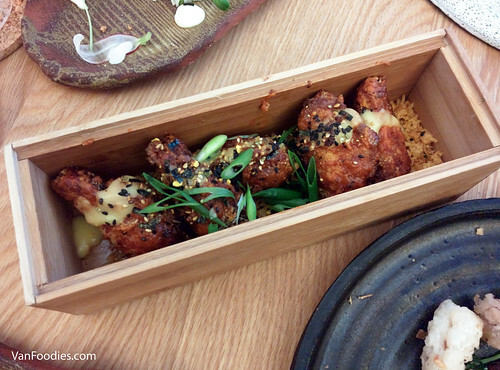 It had some nice umami flavours from the combination of tempura sauce and seafood dressing – it was sweet, it was salty, it had a hint of seafood/seaweed. 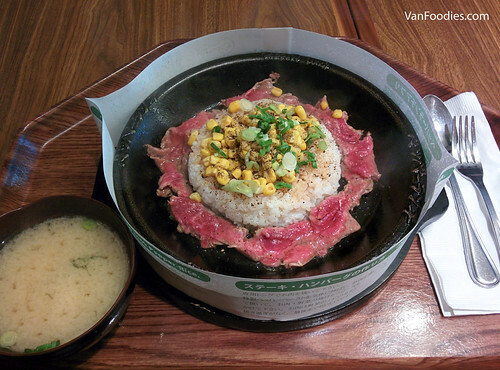 The beef was the shabu shabu kind, so it was thinly sliced, which helped soak in the flavour from the sauces. It’s really fun to eat because every spoonful gave me different combination of ingredients (it would drive Mr. crazy though, as he likes having a little bit everything in one bite). 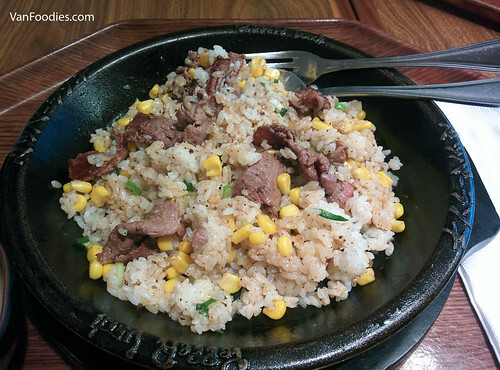 What would make this even better would be a soft pouched egg, so I would stir in the runny egg yolk into the rice bowl. That would be soooo good! Torafuku – Eyes Eat First! An impromptu dinner on a Friday evening took us to Torafuku, the new brick and mortar location brought to you by the Le Tigre food truck team. Frankly, and feeling guilty to admit to it, I never ate at Le Tigre. With the rave reviews about Le Tigre, I was quite excited to try Torafuku. The Rye So Messy Chicken Wings was an award winning dish. The gochujang marinate really came through as you can taste this garlicky, spicy flavour. The skin was crispy, meat was juicy, and I like the ramen crumble to add even more texture to it. These were really good wings, but 5 wings for $12 maybe a bit too expensive. Dr. Octopus vs. Mr. Tuna seriously sounds like a superhero movie title! Matoi Sushi – The Uni is Still Alive! My family and I used to frequent Nagano near Coquitlam Centre a lot, before it’s closed temporarily due to a fire. Since then, we have been going to Matoi at Sunwood Square by Lougheed Highway. 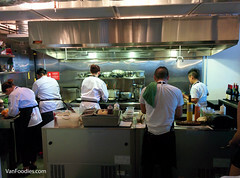 This time around, in addition to our usual staple, we also tried a few new things. 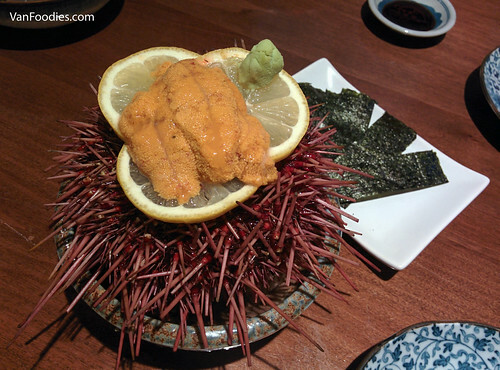 First, Fresh Sea Urchin (uni). I mean, the whole thing! If you follow me on Instagram, then you would see the video of the live sea urchin as it arrived at our table. The flesh had some natural sweetness, not stringy, and didn’t have the unpleasant fishy taste that some may have. It was served with strips of nori (seaweed), and with a few drops of soy sauce, the taste of sea was accentuated. It’s not cheap but definitely an occasional treat that’s worth every nickel (as we phased out our pennies hehe). 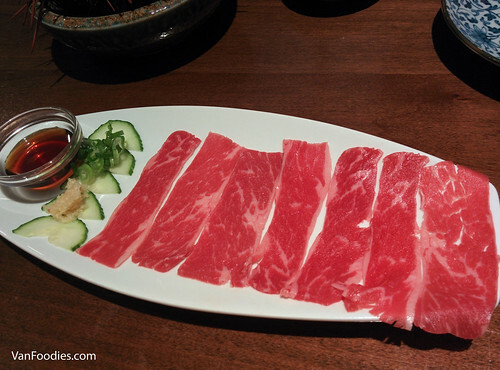 Usually Japanese restaurants serve Beef Sashimi almost tataki style, with a quick sear on the outside. Not here. It was straight up slices of raw beef, and with a dip into the yuzu based sauce, you can actually taste the beefy flavour. Our order had some nice marbling, so the meat slices just melt in your mouth. I was hesitant about the 100% raw beef but it was actually really good. It’s date night. 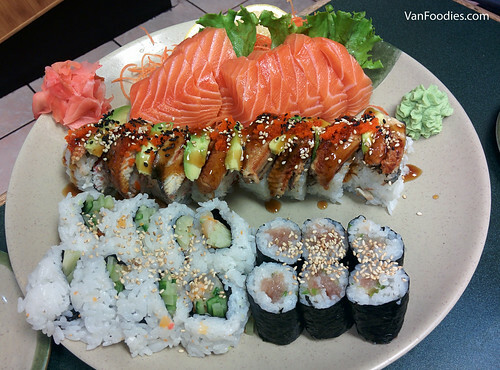 And once again, we were craving for sushi, so we continued our journey in exploring sushi restaurants in Richmond. Tokyo Joe’s is always busy whenever we are in the area and take a peek inside, so on this day, we finally walked inside. We ordered a number of things, and unexpectedly, they all arrived on one big plate. 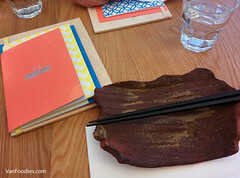 The Salmon Sashimi tasted fresh, not too fatty and with firm texture. The slices were pretty big, too, and cost us $13.25. 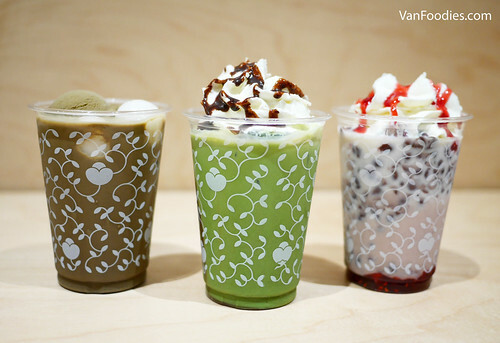 BanZai is still on top of our list for offering the best bang for the buck. The Stamina Roll had unagi (BBQ eel), avocado, crab meat and smoked salmon. It was packed with lots of ingredients; with a good mix of sweetness from the BBQ eel sauce and saltiness in the smoked salmon. It reminded me of a dragon roll (crab meat, fake or not, with avocado, unagi and tobiko – but some dragon rolls may not have the crab meat part), which is what I usually order because I like unagi. The Chopped Scallop Roll, my sushi staple, was quite good.